These reports can either be scheduled to run at set times each week or can be run at the time of your choosing. 1. Hover over Competitions and click Media Reports. 2. 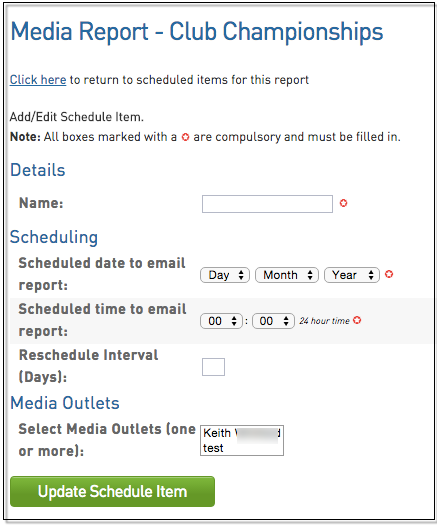 To schedule a report to be run, click on the Schedule link for the name of the report that you wish to setup. 3. Click on the Add button to add a Schedule Item in the top right hand corner. 4. Then enter the name that you would like to call this instance of a Scheduled Report which incorporates what the report is and who it is being sent to as this will allow you to easily identify the scheduled instance when required. It is then important to enter what date and time you would like to send the first report at and then the interval between the days that it is being sent (i.e if you would like the report sent every Saturday then the Interval will be 7). As each report can be sent to different Media Outlets and display different competitions it is important to choose which ones will be applicable to this Scheduled Report. 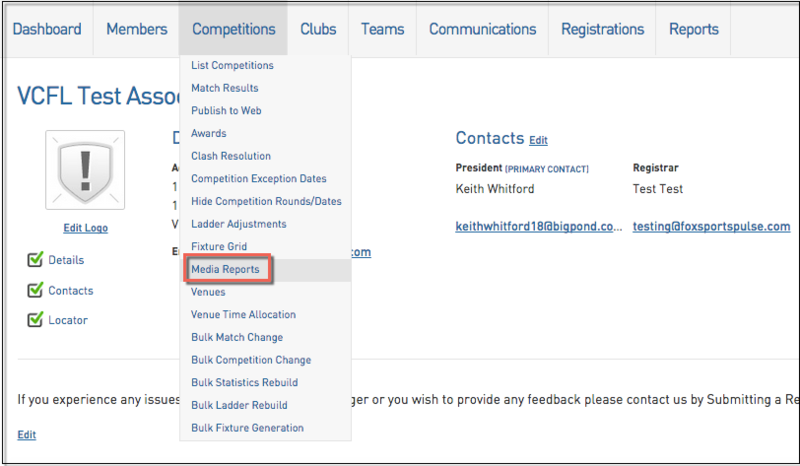 This allows you to send your top league's information to newspapers or radio but not include any junior competitions or vice versa. Once filled out, click Update Schedule Item.